JOHN ASHER: Let me introduce Javier Castellano, the winner of the 142nd running of the Kentucky Oaks where Cash Is King, L.L.C. 's, Cathryn Sophia wins the Kentucky Oaks here today and has the chance to pull off the Oaks?Derby double as he rides Destin tomorrow in the 142nd Kentucky Derby. Javier, thanks for being here. We are impressed by your dedication running both those races after winning a big one like the Oaks. Congratulations. Talk a bit about this filly and your journey as you were an emphatic winner here today. JAVIER CASTELLANO: First of all, I would like to say thank you for everybody to put it together to get it done to this filly. I think excellent job, Mr. Servis. He did it with a filly. It was amazing the way she did it. And the question mark before we go to the race was how far she can get to the extra mile. And I think in the alley she fell to go one mile. But remember one thing. John said she only ran three time in her career. And she started developing herself. And that's the first time she go to turn. And those are the little things. We put it together. I think, John, he did a great job to stretch the filly to have a lot of confidence to get prepared for this race. Very thankful everything worked out the right way and the right time and we get it done today. JOHN ASHER: This is the third time you had ridden her. You had ridden her in the Davona Dale at Gulfstream Park. She came up a little bit short at the Ashland and at Keeneland. John said he wondered about the mile and an eighth with her. What were your thoughts on her coming out of that race? JAVIER CASTELLANO: You had to be prepared mentally. Because the key to be successful today was to try to get relaxed and try to get her to the extra mile. I know it's a mile and an eighth. Most of the horses, we are on the same page. You never get to the mile and an eighth. That's the first time. And I tried to take advantage. A lot of speed in the race. I see the way it handicapped the race. I think two, three, horses went to the lead. My target was the way I handicap, I think it was Rachel Valentina. I think it was to follow her all the way on the race. And I think turning for home, there were a lot of horses and just tried to wait a little longer. JOHN ASHER: At one point, you were feeling "oh, boy?" JAVIER CASTELLANO: Turning for home, the quarter pole where I felt she was still in the bridle, and she was still pulling pulling. I think now is time to go. I think as a filly, she wants to let her run and try to get it done. I know it's the longest stretch. I'd try to concern a little bit those close that come from behind. The way she did it turning for home, I think nobody can beat that filly today. JOHN ASHER: You rode her before a record crowd today, 124,583. JOHN ASHER: You love the spotlight. Q. Javier, you are in a position where you could sweep the Oaks?Derby double. Have you even thought about that and what an accomplishment that would be? JAVIER CASTELLANO: Mentally, when you come to places like that, the big races, you always prepare yourself and try to move forward and try to handicap a race, try to start it a little bit. But you always have your thoughts. You try to be thinking big and try to sweep the move and try to win those two races, to the bigger races. Of course, Cathryn Sophia she was doing really well. And I think I knew I had a lot of confidence to get it done today. And she did. And I'm very satisfied the way we did it today. But tomorrow is another day. You have to think about it tomorrow. I think Destin have a lot of chance to win the race tomorrow. I know it's not going to be an easy race. Of course, everybody had to earn it. I think with the Kentucky Derby, you got to have a lot of luck. You have to be in the right spot, in the right position to win the race. I respect a lot of horses. One horse you have to respect is Nyquist. He go different straight, different track. I think that's a hard target to win the race. But the rest is a wide?open race. And you have to be lucky. Hopefully, it could be tomorrow. Q. What did this horse do today better than what she did in the Ashland when two of the horses she ran against today beat her? JAVIER CASTELLANO: Like I said in the beginning, the filly rode two times. She get tired a little bit. She had never been in that position before. After the race, to put her in the belt, I think you move forward. A couple workouts after that, she make a fit to get to the next level. And she did it. I give her a lot of respect. I give a lot of respect for all the group they put it together to get it done. And the efforts of the rider and the trainer, everybody put a little bit of effort to get it done today. Q. Did John communicate anything to you that things might go a little different today than in the Ashland? JAVIER CASTELLANO: Well, we didn't discuss before to go to the race. He called me a couple of times. We had a meeting together. We always have the question, you think you can go that far? I think so. She is quick out of the gate. If he didn't have the speed, I want to go to the pace. The way I handicapped the position and the speed, I think today it was today. Today was the day you need to cover up enough to find the last kick. Basically, he told me today ride a lot of confidence. The filly has been training so good. He let us ?? up to you. You are the top jockey in the country. You decide what to do. I do my job. Now she won. JOHN ASHER: You are clearly not just one of the top jockeys in the country but in the world. Your career is going very well right now. You are winning a lot of races. You are up there. What do this horse and this race mean to you in terms of where you are in your career right now? 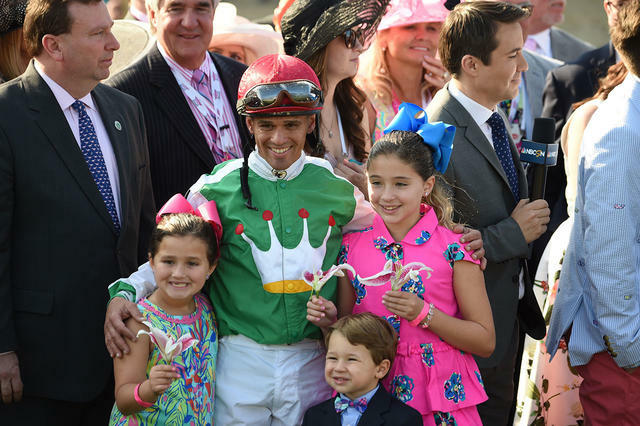 JAVIER CASTELLANO: It means a lot to me. Because this is my first Oaks, to win the race. In the past, I had a lot of success and finished third. Give me a couple good races. But you always want to win the race. You dream. You target to those races, to Triple Crown races. And it's a good start today. I think today is a good day to move forward. I think tomorrow is another day. Tomorrow is my target to win the Derby, my first Derby. I hope so. I have been praying so much and, hopefully, try to get it done this year. JOHN ASHER: Talk about now you got this under your belt, you are looking forward to it. Will it be something you think about a lot tonight? Will you go over it in your head? How do you prepare? That's obviously a huge goal for you. JAVIER CASTELLANO: A lot of things go through my mind, of course. No question about it. But when the time comes, you forget all those things and you focus yourself and try to find the best horses in the race, try to handicap it. Hopefully have a good clear break out of the gate and try to find the best spot in the race to move forward. You analyze the race a lot before the race, and you handicap it. You handicap the jockey, the horses. And you put everything together. It's like a puzzle. You put everything together and try to do the best you can because sometimes when all the jockeys ?? most of the jockeys we think of something before the race. But as soon as you open the gate, you have to use your plan A or you have to use your plan B. You have to go for whatever you can to ease in and try it take it from there. JOHN ASHER: We haven't had too many riders win both races. The last was Calvin Borel, 2009, with Rachel Alexandra and Mine That Bird. It is a rare feat. I know you want that first Derby win. But winning both of these this weekend would be pretty special. JAVIER CASTELLANO: Of course. I give a lot of credit to Mr. Borel, he did a good job. Not too many horses, not too many jockeys did it the way he did it the last couple years, I think he has been a very successful rider. Hopefully, you know, could be my turn.